South-Tek Systems announces the third installation of an N2-GEN C Series PSA Nitrogen Generator at a Fortune 500 roofing manufacturing company. South-Tek Systems is pleased to announce their third PSA Nitrogen Generator installation at a major roofing manufacturing company. This was an indoor installation of our PSA N2 GEN 40C in the company's facility located in Houston, TX. The system at this facility included an Oxygen Analyzer for continuous monitoring of the Nitrogen from the 120 Gallon storage tank which directly feeds into the plant's Nitrogen line. Compressed air needed to operate the Nitrogen Generator was supplied by the facility's plant air system. South-Tek Systems has worked closely with the company, having installed PSA (Pressure Swing Adsorption) Nitrogen Generators at two other facilities in Maryland and Indiana. The Nitrogen Generators were utilized for a variety of applications within the company including blanketing of the tar that is used to seal the roofing shingles. Being an inert gas, Nitrogen eliminates oxygen and other residual molecules within the process, preventing contamination and oxidation of the tar. With Nitrogen comprising 79% of the air we breathe, South-Tek Systems' PSA Nitrogen Generators mechanically filter out the other gases, concentrating the Nitrogen into a storage tank for your process usage. The technology is safe, reliable, cost-effective, and fully automatic. Using a Nitrogen Generator to produce high purity N2 gas on-demand at the point of process can reduce gas costs by as much as 90%! Installing a Nitrogen Generator from South-Tek Systems can deliver a Return on Investment in as little as 18 months and provide a low cost of operation throughout the systems' life span of 20+ years. South-Tek Systems looks forward to continuing their relationship with this Fortune 500 Company and installing additional units in the near future. 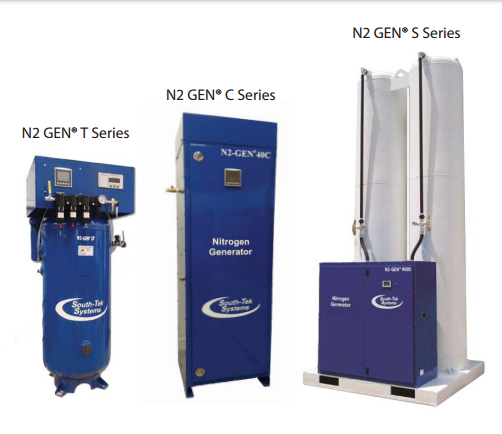 For more information on South-Tek Systems' Nitrogen Generators, download our brochure or contact us at 888-526-6284. Optical instruments rely on nitrogen for a process known as "purging." This process ensures that the optical lenses remain fog-proof or water-proof. Purging with N2 gas can apply to a variety of optical instruments, including night vision goggles, binoculars, cameras, microscopes, telescopes and more. Many of the products that rely on nitrogen gas for optical purging are used by the U.S. military. Soldiers in the field rely on a variety of optical equipment for a number of operations. For example, soldiers regularly rely on night vision goggles to guard bases, plan maneuvers and scout out the enemy. In order to keep their goggles from fogging, soldiers must regularly purge them with nitrogen to eliminate contaminants and moisture. Compact, portable Nitrogen Generators are designed specifically for this purpose. These generators provide a lightweight, safe and reliable solution to optics purging in the field. See news about the N2-GEN portable Nitrogen Generator completing the U.S. military EMIP review process. Using nitrogen doesn't just prevent the optical equipment's lenses from fogging on the outside. The benefits of using nitrogen to purge optical equipment also include preventing internal fogging, creating a waterproof environment, and preventing the formation of mold and mildew. Filling optical equipment with nitrogen replaces the naturally occurring oxygen and prevents the accumulation of moisture, which can not only fog the equipment, but can also lead to the development of mold or fungus. After the equipment is purged with nitrogen, it can then be sealed to further prevent any accumulation of moisture. The sealing process makes nitrogen-purged equipment waterproof, preventing moisture from entering the area around the lenses and putting a proactive halt to the growth of microorganisms that thrive in moist environments. Mold, fungus and mildew develop most rapidly in warm, moist enclosed spaces. Using nitrogen to purge and then seal optical equipment is the most effective solution to preventing these unwanted effects. And the most cost-effective, reliable way to purge optical equipment could be with a portable Nitrogen Generator from South-Tek Systems. Whether being used in military operations, field research, or mass-production factories and laboratories, South-Tek Systems can deliver an on-site Nitrogen Generation System that provides you with a never-ending supply of high-purity N2 for safe, effective use. South-Tek System's portable Nitrogen Generator can offer easy, quick optical purging for uses in a variety of industrial, military or consumer settings. For more information how nitrogen gas can benefit optic lens use and production, call 888-526-6284. You can also send us your questions and request free information by filling out our online contact form. We look forward to hearing from you! South-Tek Systems announces the selection and installation of a PSA Nitrogen Generator System at a major university's new research test center in Georgia. South-Tek Systems is delighted to be chosen as a supplier of Nitrogen for use in a large research project at a major university in Georgia. This project consisted of both a Nitrogen Generator and high pressure booster, which allowed for Nitrogen to be delivered at the required pressure of 2,000 psi. The Nitrogen Generator was placed outdoors and included a Nema 4 Electrical Package to protect the control panel from harsh weather conditions. Utilizing a PSA (Pressure Swing Adsorption) N2 GEN-850S Nitrogen Generator in their process, the university is able to produce an unlimited supply of Nitrogen, on-demand, eliminating the need for an outside source of Nitrogen gas. South-Tek Systems worked closely with the engineering firm, EXP, who designed and built the new test facility. EXP offers a vast range of services including buildings, earth & environment, energy, industrial, and infrastructure. Their client base is comprised of Fortune 500 companies with projects ranging from pharmaceuticals to biofuels to food processing and many more. The strong collaboration between South-Tek Systems and EXP allowed for a smooth and effortless installation of the Nitrogen Generator. Using a Nitrogen Generator to produce high purity N2 gas on-demand at the point of process can reduce gas costs by as much as 90%! Installing a Nitrogen Generator from South-Tek Systems can deliver a Return on Investment in as little as 18 months and provide a low cost of operation throughout the systems' life span of 20 years or more. South-Tek Systems has installations in many other labs and universities in the United States, the Middle East, and Africa. The most common applications for Nitrogen Generators are LC/MS, Dry Box, IVF, and Pharmaceuticals. An increasing number of universities and labs are realizing the cost benefits of generating their own Nitrogen with a Nitrogen Generator from South-Tek Systems amid the improvements in efficiency, safety, and reliability. 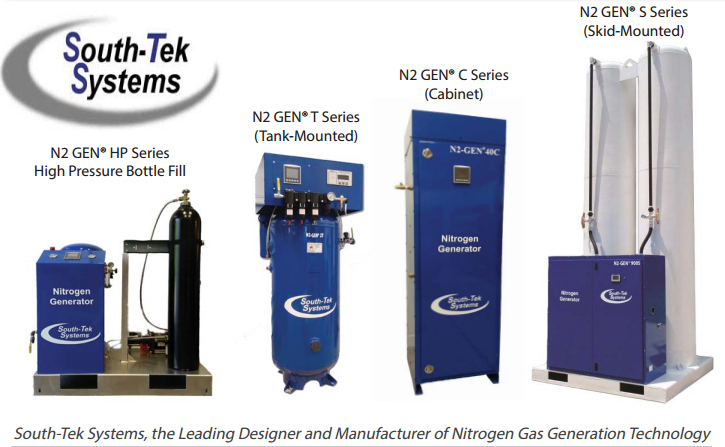 For more information on South-Tek Systems' Nitrogen Generators for University, Lab, and Research Applications, download our brochure or contact us at 888-526-6284.